Out of Indore airport into the crazy traffic of an Indian city. 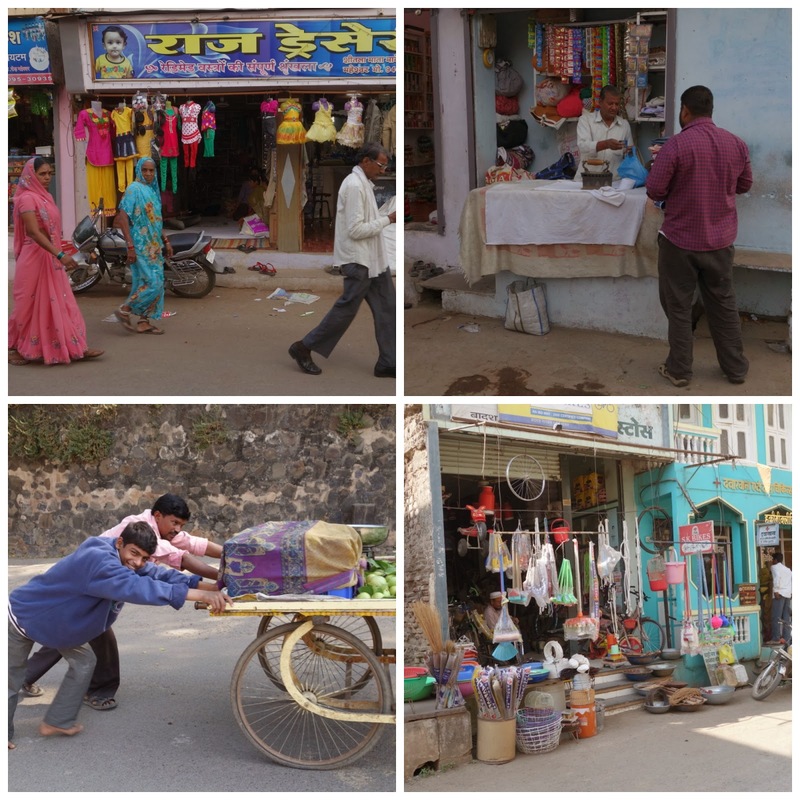 We are headed to Maheshwar, which is well off the beaten track, and two and half hours away from the airport. We drive past the slum of corrugated tin shacks and tiny mobile shops. There are people everywhere, yellow and green tuc-tucs and scooters weaving around them and the constant noise of horns. There is pottery drying in the sun by the roadside, men making bricks, little stalls selling a variety of nuts. Everyone is on a mission trying to earn a living in a trillion innovative ways. There are more traditional forms of transport too. Cattle carts and water buffalo. Some cows with their horns painted. Closer to Maheshwar we see a herd of haughty camels walking along the roadside with their turbaned herder. 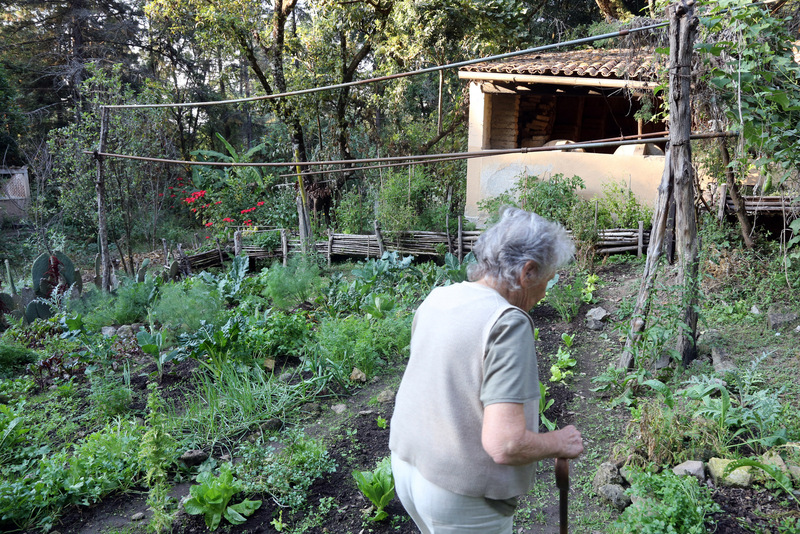 In the countryside and villages the women are all wearing saris, and some older men are still wearing the dhoti. But in the cities many are opting for western clothes. Indians are very devout and worship a million gods, so there are a myriad of temples along the road, some just tiny grottos, others huge and elaborately decorated and garlanded. 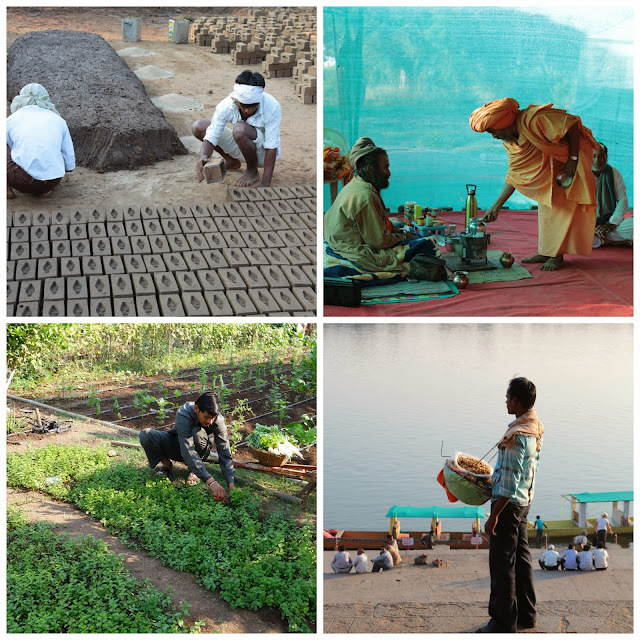 These also create opportunities for others to sell marigold garlands, incense and other offerings. Everywhere is a riot of color. There's a wide diversity of crops, every scrap of land is used for cotton, sugarcane, papayas, and mangoes which are at their juicy best during the monsoon season. The cherimoya season has just finished but there are lots of dates and chestnuts which they roast until charred black then split. The sheer regional diversity of the food in India makes it intriguing and deliciously rewarding but difficult to define. From the rich meaty dishes of the Moguls in the North to the superb variety of vegetarian and fish dishes, the rice, breads, the dahls, fruits, pickles and relishes. Religion plays a major part in people’s diets and is considered to be as critical to the mind as the body. India’s Sikh, Parsi and Christian communities have little or no restrictions on what they eat. Hindus do not eat beef as the cow is sacred and revered. Traditionally they avoid foods that are thought to inhibit spiritual or physical development: some devout Hindus also avoid onions and garlic as do the Jains who believe they heat the blood and inflame sexual desire. The Jains are also strict vegetarians and there are rigid restrictions to avoid injury even to insects so they don’t eat any vegetable that comes from below the ground for fear of potential damage during cultivation and harvesting. Buddhists are mostly vegetarian and pork is strictly taboo for Muslims many of who also avoid alcohol. 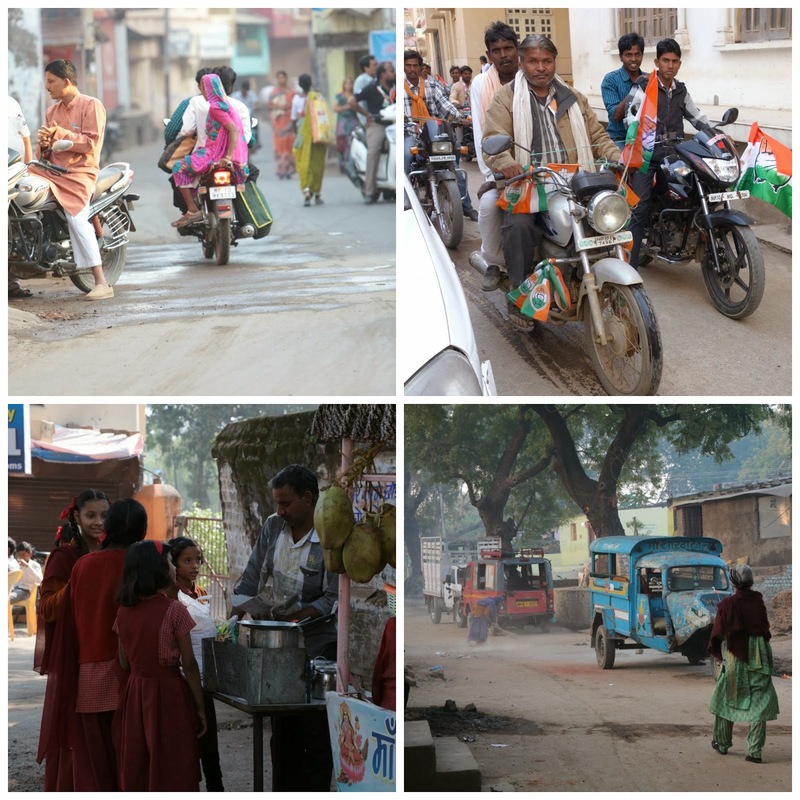 Many Indians also fast once and sometimes twice a week or longer to gain spiritual rewards and also to better understand the suffering of the poor. Ayurveda, the ancient science of health and longevity also influences food customs. 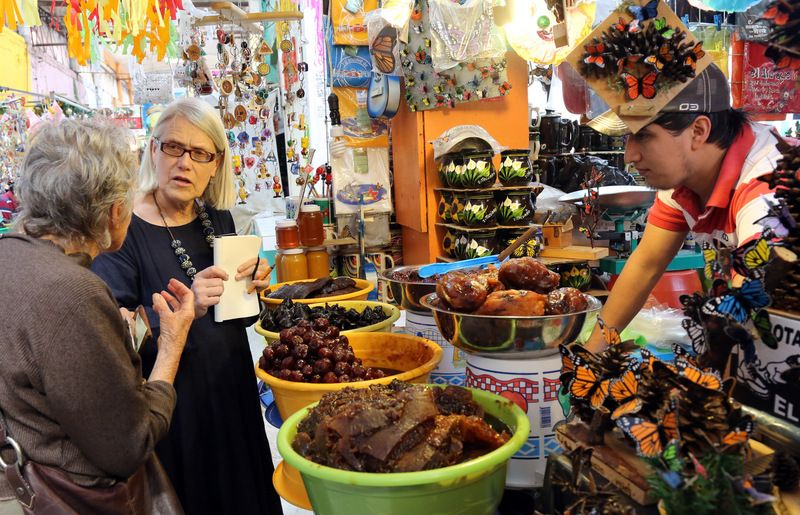 The whole mix makes for a fascinating and diverse food culture which I always relish the opportunity to explore and learn more about on our travels. 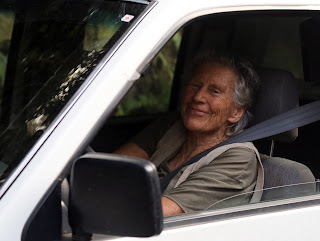 Diana Kennedy arrived to collect us from our little hotel near Zicateuro in the state of Michoacan in Mexico in her aged Nissan truck, a feisty 89-year-old who on her own admission doesn't suffer fools gladly. No power steering here, we were flabbergasted by her sheer physical strength as she turned this trusty old vehicle with 12 inch wide tyres in an impossibly awkward space, Diana was not to be defeated and off we sped up the bumpy cobbled road to her little farm, a biological preserve she has created on seven hectares gradually acquired over 35 years. 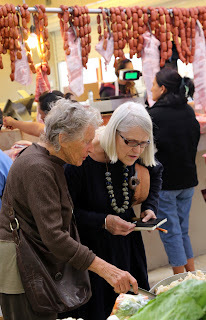 She is a truly remarkable woman who has created a body of work on Mexican food of such importance and integrity that she has been awarded the highest honor given to foreigners by the Mexican government, the Order of the Aztec Eagle, for her work of disseminating Mexican culture through its foods. 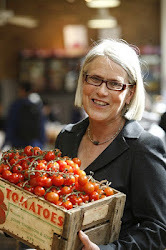 There have been numerous other awards from gastronomic institutions all over the world and an OBE from Queen Elizabeth for her contribution to strengthening cultural relations between Mexico and the United Kingdom. 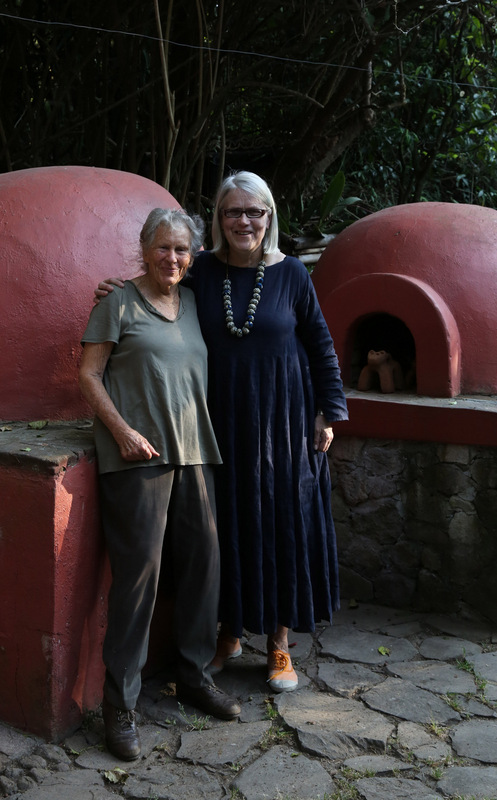 Diana, originally from Essex was first introduced to Mexico by her husband Paul Kennedy, a foreign correspondent for the New York Times in the 1970's. We are welcomed up the stone steps into her beautiful, rambling house built on several levels around the huge boulders of the hillside, the atmosphere is gentle and relaxing, lots of timber, book-filled shelves, simple antique and craft furniture and a splendid collection of utilitarian pottery from all over Mexico. Diana's kitchen is so beautiful, long horizontal timber windows overlooking the outdoor eating area with wood-burning ovens and a char-grill. 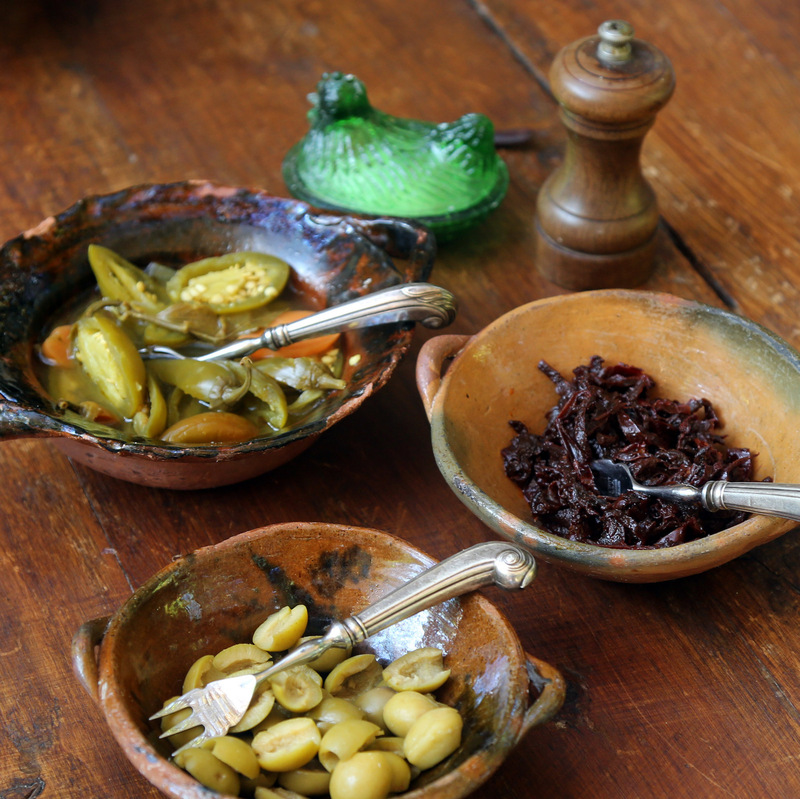 The dresser is laden with beautiful pots and casuelas, well-used and much loved. There's a tiled 'peninsula' in the kitchen with several gas jets and pots and jars full of intriguing ingredients and utensils, lots of assorted wooden chopping boards and blue enamel spoons. 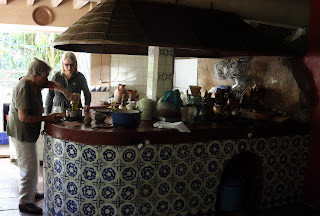 Along the walls and overhead, there's a pleasing collection of saucepans, sieves and other Mexican utensils including a Molina for frothing up hot chocolate. We've been invited to join Diana for comida, the traditional Mexican main meal usually eaten at 3pm. First we have a relaxing beer and catch up, it's been several years since we met, conversation ranges from Diana's research for her last book on the food of Oaxaca, a province we both know and love, to the myth about fat, and the preservation of her jotters which contain the notes from her travels through Mexican villages and the recipes she has collected from cooks throughout the country over a period of 35 years., a priceless resource which will now be preserved. 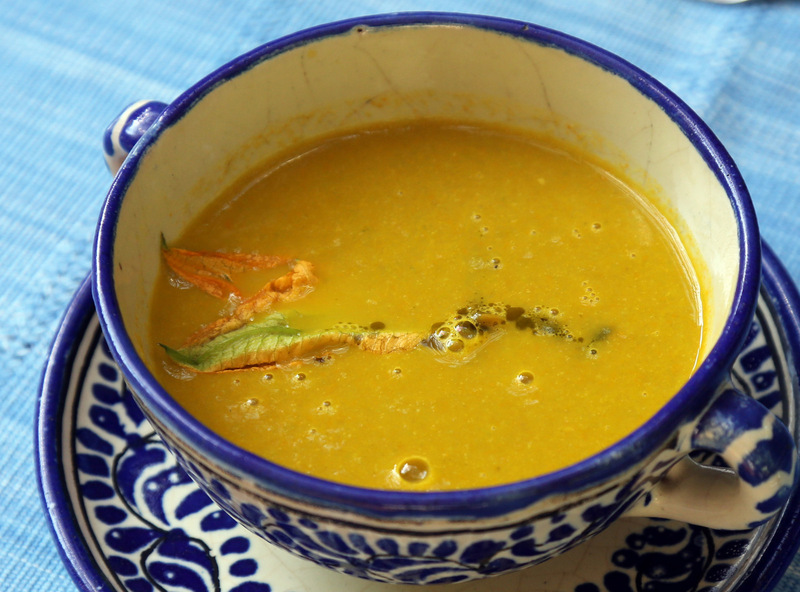 Our feast started with a rich yellow ochre squash blossom soup with roast poblano chili and squash blossom on top. This was followed by a delicious chicken cooked in pulque with rice and pickles. 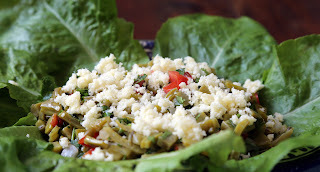 Next we had a nopale leaf salad with lettuce from the garden. Nopale are huge cactus leaves as big as a table tennis bat, which are trimmed of thorns and cooked to tenderness. 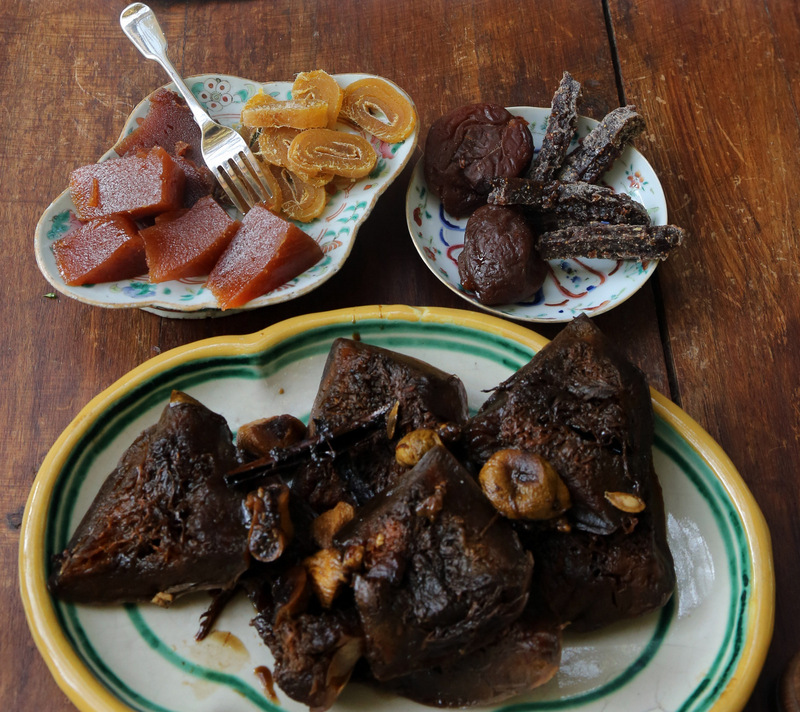 Finally a selection of sweetmeats, all homemade: peaches from the garden, green mango, squash, figs, all preserved. Diana loves to cook and does everything from scratch. The coffee, served in pretty china cups, is home grown, Arabica beans, fermented, roasted and freshly ground. After comida, Diana took us for a walk around the vegetable garden and farm, the biodiversity on this little farm is truly astonishing, vegetables and fruit even watercress, asparagus and raspberries beside loquats, guavas, and a variety of citrus. Next day, we went with Diana to the bustling market in Zitacuero, I bought several bunches of beautiful cinnamon and a couple of casuelas, Numerous types of chilies and dried shrimps, sacks of beans, corn-fed chickens, freshly butchered meat and every imaginable type of offal were piled high as well as fresh vegetables and fruit, Mexican herbs and spices. 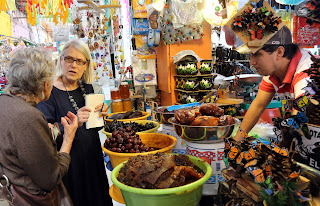 Other stallholders sold kitchen utensils, fresh fish, a variety of bread and freshly squeezed juices. The comida that day started with a salad of leaves from the garden with little foie gras croutons and sublime Huitlacoche crepes and sweetmeats once more followed by excellent coffee. 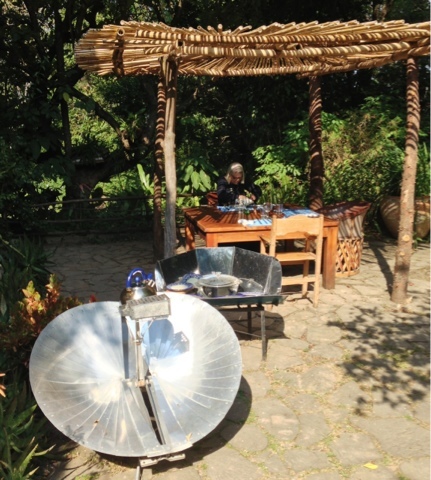 Diana has a solar plate warmer to heat her plates and another to heat up her kettle, it's several thousand feet above sea level, so it takes ages! We ran out of time because we had to get back to Mexico City before dark, we didn't realise that we were in the middle of narcoland, a totally no-go area for Americans, so no driver would agree to drive after dark, aaaaah! We stayed at the airport Camino Real so we could catch our 8am flight to Oacaca and another adventure. Guess what? 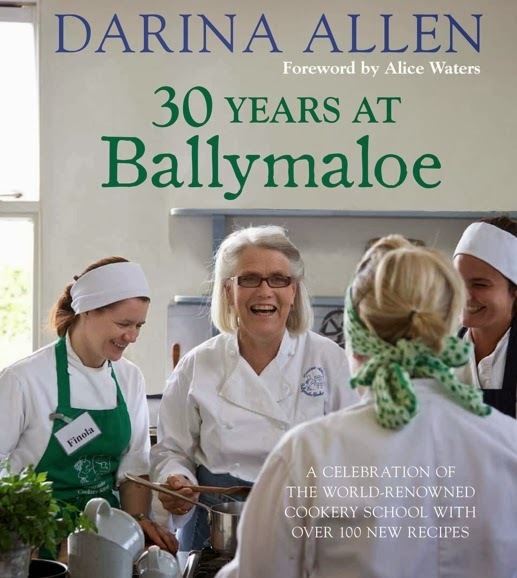 My latest book, 30 Years at Ballymaloe, won the Avonmore Cookbook of the Year at the Bord Gais Irish Book Awards last week. It was actually a total surprise.The whole thing was televised, and very glitzy. In fact it was such a surprise that I didn't even have a speech prepared, but I blustered through it. I do want to say special thanks to Avonmore and Bord Gais for sponsoring these awards. I was in very good company: Rachel’s Everyday Kitchen and Catherine Fulvio’s The Weekend Chef were also shortlisted as were Neven Maguire’s The Nation’s Favourite Food, Kevin Dundon’s Modern Irish Food and Ross Lewis for his beautifully produced Chapter One – An Irish Food Story. The other bit of excitement we had this week Rachel and I were on Brendan O'Connor on Saturday Night, our first interview together! If you’re doing your Christmas shopping at the moment, you can order a copy of my book and I will sign and put a special personal message in it for you too. Or of course you can get it on Amazon! 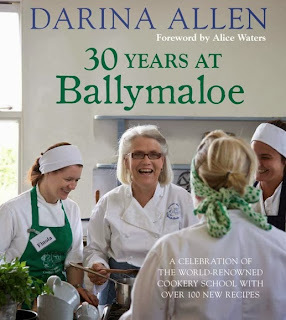 We're running a great competition which is open to the 16th December - just name the year that a number of images featuring me in my trade mark glasses were taken, and win one of 30 two-and-a-half day courses here at the Ballymaloe Cookery School. For more details see our website. And don't forget Rory O'Connell's Master It, which I personally think is the cookbook of the year. Yes, he’s my brother and you may well be thinking ‘well she would say that, wouldn’t she?’ but that’s what I truly believe. His long overdue book is a real gem. And on the subject of books, I’d also I'd like to draw your attention to a semi-secret gem that you might not have come across yet, The RainbowWay: Cultivating Creativity in the Midst of Motherhood, a new book by Lucy Pearce, a long-time friend of the family.